If you are looking for a gift for someone who thinks they know everything about London, buy them Curiocity: In Pursuit of London– and they will almost certainly discover at least a few things they didn’t know. A long time ago, back when I was a student. I read a book called Invisible Cities by Italo Calvino. It portrays the way a city is really many different cities all layered on top of each other. Of course there are the layers of history, but there are also different perceptions. The night-time city is different from that of the daytime. The tourist’s city is different from the commuter’s. The buildings the architect planned are different from the way those who live there experience them. As Londoners we are used to visualising our city differently depending on what maps we use. The familiar map of the Underground routes is utterly different from what we see on an A-Z, or on Google Streetview. Yet these are all London. 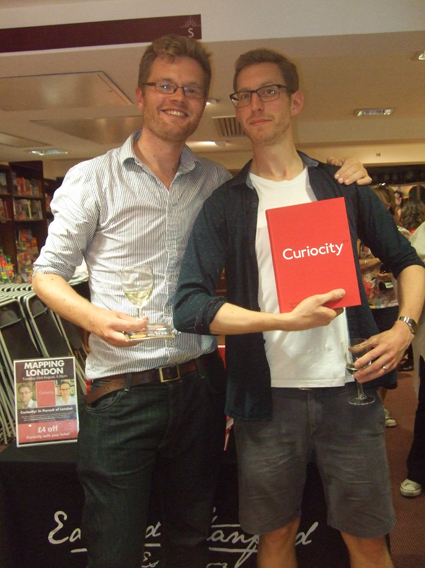 It is those different Londons that Curiocity creators Henry Eliot and Matt Lloyd-Rose have tried to capture. Their massive red book shows 26 different ways of viewing London via various themes. These include its buildings, its waterways, the traffic networks, the people and even how its waste is dispersed; but also less tangible things like love, knowledge, vanitas and wyrd. These chapters come with maps of London as different from the standard A-Z as you could imagine. 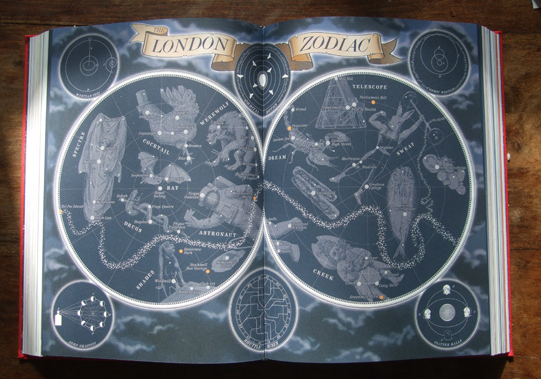 At the top you can see a picture of the city viewed as a zodiac. Other maps show London as crowdformations, as an archipelago, a panopticon, a hive of industry and (pictured at the bottom) as William Blake's spiritual city of Golgonooza. 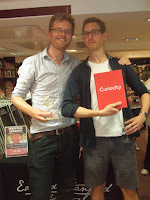 I mentioned that Curiocity is a massive book – 452 pages long. But don’t feel you have to start at the beginning and read through to the end. There are suggestions of ways to wander through its pages. You could just dip in and out, you could start at the back and use the index to navigate, or you could try out a form of numerology and add up the numbers in your birth date to find a page that might indicate your future. I bet it would be correct too, as every chapter is so full of fascinating suggestions of places to visit that you will probably find yourself planning an excursion. My personal favourite chapter is entitled Wyrd and is about occult and mystical London. It starts by describing various famous and infamous grimoires and magical tomes housed in the British Library, the Wellcome Collection, University College London and the Warburg Institute. It goes on to suggest things to do in London to celebrate the eight festivals of the pagan wheel of the year. This is followed by details of occult shops – including one that probably never existed. Druids and witches get a page each – and I was delighted to read the name of my good friend Rebecca Bird mentioned in connection with the wonderful moot she runs. 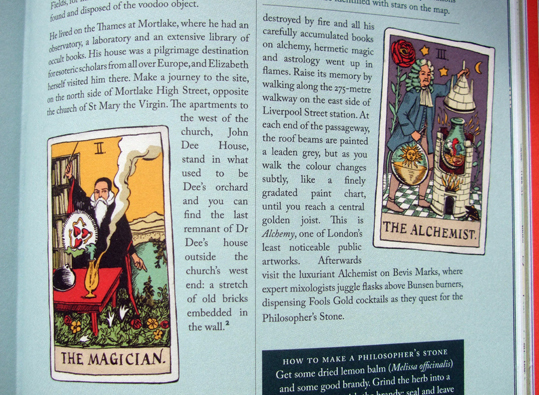 A Tarot of London is invented, with famous people cast in the roles of the major arcana, with John Dee as the Magician, Aleister Crowley as the Devil, Dion Fortune as the High Priestess – and a few newly invented cards including Elias Ashmole as the Alchemist and Austin Osman Spare as the Artist. 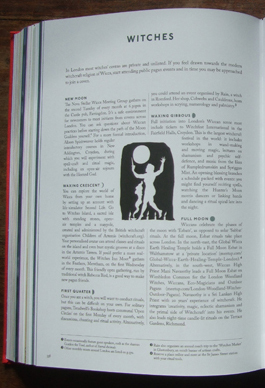 London’s ley lines and earth stars get pages, followed by a listing of moots and a Last Rites section of random Forteana. It will, of course, slide into a past tense as this book gradually changes from a functional guide into a historical record. When London eventually degenerates into toxic marshland, it will hopefully provide future inhabitants with an account of what people once got up to. It could also serve as a cudgel for beating off mutant rats.